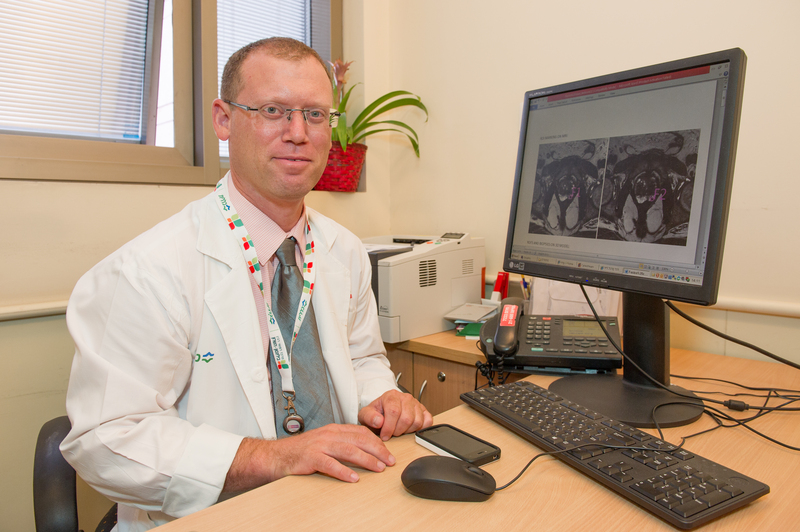 Doctor Margel conducts urology & prostate BRCA research at Israel’s Rabin Medical Center. Dr. David Margel, Division of Urology at the Davidoff Cancer Center at Rabin Medical Center, is one of the foremost prostate cancer researchers in Israel. His study entitled, Personalized Prostate Cancer Screening among Male Carrying in the BRCA 1 & 2 Genes, explains the hesitancy and importance when dealing with prostate cancer. Prostate cancer screening is highly debatable among the general population; however, among those with a high risk it is appealing. Recent studies suggest that men carrying mutations in the BRCA 1 & 2 genes may be at an increased risk of developing prostate cancer. They also develop prostate cancer at a younger age that is often more aggressive. Israel has a large population of BRCA carriers (2.6% in Ashkenazi Jews, compared to 0.2% in the world). Rabin Medical Center’s Recanati Genetics Institute includes data on over 1,000 BRCA mutation carriers. Rabin also has a BRCA Multidisciplinary Clinic, which is a high-risk clinic that focuses on women who are BRCA mutation carriers. However, Dr. Margel noticed that there is less awareness to male BRCA mutation carriers. Therefore, he and his division opened a clinic specifically for male BRCA gene mutation carriers on February 2012 in the Davidoff Cancer Center at Rabin Medical Center. Routine screening for prostate, breast, and colon cancers. The male BRCA clinic is rapidly expanding and since opening they have seen over 45 BRCA mutation carriers and 38 of the 45 consented to the prostate cancer screening trial. The prostate cancer screening trail is a prospective diagnostic trial of screening for prostate cancer among men with genetic predisposition. The target population are males (40-70 year old) carrying BRCA gene mutations. The overall goal is to estimate the prevalence, stage, and grade of prostate cancer in this population. As well as to create a bio-bank of tissue, urine, and serum, of this population for future research and prevention studies. Lastly, the final step will be to determine if there are any modifiable factors (environmental, nutritional life style and chemo preventive agents) that may influence prostate cancer risk. American Friends of Rabin Medical Center hosts an annual Golf Tournament that benefit BRCA research prostate screening, clinic and research. The event takes place in May at the Quaker Ridge Golf Club in Scarsdale, New York and promotes awareness around the United States, Israel and the Middle East. (see http://www.afrmc.org).